Dr Sanjay Shrawan Nimbalkar is a Lecturer in the School of Civil and Environmental Engineering at the University of Technology Sydney (UTS). 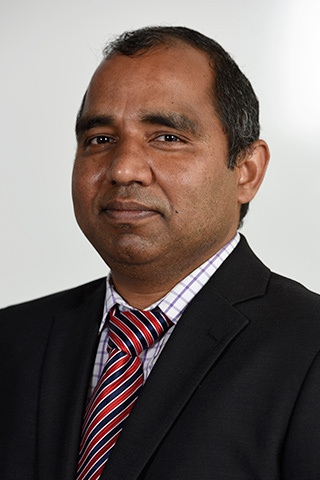 His research has strongly focused on railway track design, railway embankment stability analysis, in-situ testing, instrumentation, retaining structures, ground improvement techniques, tailing dam, constitutive and numerical Modeling. His doctoral research work on pseudo-dynamic method of analyses for earth retaining structures is considered one of most significant contributions to the field of soil dynamics and earthquake engineering. He also worked in the ARC Center of excellence for geotechnical sciences and engineering spearheaded by University of Newcastle, University of Western Australia and University of Wollongong, Australia. He has published a number of research papers in peer reviewed journals and conference proceedings both at national and international level. His scholarly articles are internationally recognised and among highly cited. He is recipient of Institution of Civil Engineer’s (ICE) 2014 Thomas Telford Premium award in the area of Ground improvement. He has more than decade experience in academics, research, training and consultancy. He has been actively involved in geotechnical site investigation, full-scale in-situ track monitoring and design of rail infrastructure for both civil and transportation industries. He has also played an active role in a number of contract research, testing and consultancy projects in Australia and India. He is also serving as reviewer in a number of reputed national and international journals. © 2019 Institute of Rock and Soil Mechanics, Chinese Academy of Sciences Particle breakage is commonly observed in granular materials when subjected to external loads. It was found that particle breakage would occur during both sample preparation and loading stages. However, main attention was usually paid to the particle breakage behaviour of samples during loading stage. This study attempts to explore the breakage behaviour of granular materials during sample preparation. Triaxial samples of rockfill aggregates are prepared by layered compaction method to achieve different relative densities. Extents of particle breakage based on the gradings before and after test are presented and analysed. It is found that particle breakage during sample preparation cannot be ignored. Gradings after test are observed to shift away from the initial grading. Aggregates with larger size that appear to break are more than the smaller-sized ones. Irrespective of the initial gradings, an increase in the extent of particle breakage with the increasing relative density is observed during sample preparation. © 2019 American Society of Civil Engineers. In pile-reinforced dams and bank slopes, the antislide effect of piles and drawdown of reservoirs are two aspects that could significantly affect the slope stability. However, existing studies have incorporated these two factors separately, albeit not in tandem. Moreover, stability assessment of these earth structures is usually performed ignoring the three-dimensional (3D) effect. To address these issues, the kinematic approach of limit analysis is adopted in this technical note for evaluating slope stability based on the 3D rotational failure mechanism. In addition, the coupled effects of pile reinforcement and water drawdown are considered. The analysis is performed for four types of drawdown cases. The results demonstrate that the optimal pile location undergoes significant change during the external drawdown process, while the effect of the declining water level on slope stability follows the similar pattern for varying pile locations. © 2018 American Society of Civil Engineers. Major offshore and onshore structures, including transport corridors and high-rise buildings, resting on soft compressible clays are often supported by pile foundations. Apart from the usual vertical loading from the superstructures, these piles are usually subjected to large cyclic loads arising from the actions of waves, ship impacts, or moving vehicles. Under such circumstances, vertical and lateral modes of cyclic loading are predominant and affect overall stability. Such repetitive loading on piles leads to reversal of axial stresses in the adjacent soft clay, initiating progressive degradation in soil strength and stiffness that deteriorates the pile capacity with unacceptable displacements. Although several studies have been carried out to investigate the response of a single pile, a detailed investigation on a pile group in soft soil subjected to cyclic lateral loading, which is of immense practical interest to field engineers, had yet to be conducted. In this paper, extensive laboratory model tests with steel-pipe-pile groups in soft cohesive soil were conducted followed by the development of a numerical model that was based on a two-dimensional (2D) dynamic finite-element (FE) approach. The degradation of both axial and lateral capacities of the pile group and the pattern of the degradation with variations in the cyclic-loading parameters were studied. Comparisons of the experimental data with the computed results validated the numerical analysis. The study indicates that both the axial and lateral pile capacities and displacements were significantly influenced by the cyclic-loading parameters (number of cycles, frequency, and amplitude). Relevant design recommendations are presented. © 2018 Elsevier Ltd This paper proposes a three-dimensional model incorporating finite element (FE) meshes with infinite element (IE) boundaries for ballasted railways. Moving train loads are simulated with sliding motions of moving elements which have hard contact feature at the interface with supporting rails. Dynamic responses of ballasted railway under different train speeds are investigated in time domain and frequency domain to identify the predominant frequency and critical speed. Rayleigh wave (R-Wave) propagation is simulated using the combined FE-IE model to determine the velocity of R-Wave in the layered embankment model and its relationship with the critical speed of the ballasted railway. The proposed model is successfully validated against the results of Euler-Bernoulli Elastic Beam (E-BEB) model. © 2018 American Society of Civil Engineers. An analytical model is proposed for the evaluation of seismic active thrust on retaining wall resting on sandy soil. Foundation and backfill soil is idealized as Kelvin-Voigt solid. The governing differential equation of vertically propagating shear wave is solved by maintaining the displacement continuity and stress compatibility at the interface between backfill and foundation soil. Nonlinear distribution of accelerations induced in the backfill soil is then used to compute the seismic inertia force. Total seismic active thrust is obtained by solving the force equilibrium equation of the triangular failure wedge. The present method computes the strain-dependent shear-wave velocity and damping ratio of sand from its modulus reduction and damping ratio curves using an iterative scheme. Amplification and deamplification of the input excitations in the foundation soil and backfill soil are compared with results of dynamic centrifuge tests reported in the literature. An increase in the magnitude of seismic active thrust is observed when the retaining wall is situated on sandy soil in place of the rigid stratum, and the percentage increase is 18% in comparison to the latest method available in the literature. The seismic active thrust values for long period input excitations are nearly 13 to 17% higher compared to short-period input excitations. The parametric study reveals that depth of backfill and foundation soil, impedance ratio, amplitude, and frequency of input motion dominate the response of the backfill soil under seismic condition. © 2018 Institute of Rock and Soil Mechanics, Chinese Academy of Sciences In the zones of high seismic activity, tailings dam should be assessed for the stability against earthquake forces. In the present paper, a simplified method is proposed to compute the factor of safety of tailings dams. The strain-dependent dynamic properties are used to assess the stability of tailings dams under seismic conditions. The effect of foundation soil properties on the seismic stability of tailings dams is studied using the proposed method. For the given input parameters, the factor of safety for low-frequency input motions is nearly 26% lower than that for high-frequency input excitations. The impedance ratio and the depth of foundation have significant effect on the seismic factor of safety of tailings dams. The results from the proposed method are well compared with the existing pseudo-static method of analysis. Tailings dams are vulnerable to damage for low-frequency input motions. © 2018 Thomas Telford Ltd. In this study, a series of multi-stage drained reverse direct shear tests were carried out on soft clay samples reinforced with 0.25% and 0.50% polypropylene fibers of 6 mm, 10 mm and 19 mm in length. Tests were carried out at different normal effective stresses and cumulative horizontal shear displacement of 1.17 times of the sample width. Results showed an increase of the shear strength with the increase of fiber content and length. However, the rate of improvement was capped with the normal effective stress applied during the shearing stage. At a high normal effective stress, the shear strength of the fiber-reinforced soft clay approached that of the unreinforced clay regardless of the amount of fiber inclusion. The rate of shear strength improvement decayed with the number of shear cycles. Fiber reinforcement also resulted in a reduction of the compressibility of the soft clay at consecutive consolidation and shear stages. Although the effective internal friction angle of the soft clay was not altered significantly with the fiber reinforcement, the effective cohesion of the soft clay improved significantly as much as 6.4 and 8.5 times with the inclusion of 0.25% and 0.50% of 10 mm long fibers, respectively. Nimbalkar, S, Dash, SK & Indraratna, B 2018, 'Performance of ballasted track under impact loading and applications of recycled rubber inclusion', Geotechnical Engineering, vol. 49, no. 4, pp. 79-91. © 2018 Chinese Academy of Sciences. All rights reserved. In this paper a review of the sources of impact loads and their effect on the performance of ballasted track is presented. The typical characteristics and implications of impact loading on track deterioration, particularly ballast degradation, are discussed. None of the procedures so far developed to design rail track incorporate the impact that dynamic loading has on the breakage of ballast and therefore it can be said to be incomplete. An intensive study on the impact of induced ballast breakage is needed in order to understand this phenomenon and then use the knowledge gained to further advance the design methodology. A stiff track structure can create severe dynamic loading under operating conditions which causes large scale component failure and increases maintenance requirements. Installing resilient mats such as rubber pads (ballast mat, soffit pad) in rail tracks can attenuate the dynamic force and improve overall performance. The efficacy of ballast mats to reduce structural noise and ground vibration has been studied extensively, but a few recent studies has reported how ballast mats and soffit pads reduce ballast degradation, thus obviating the necessity of a comprehensive study in this direction. 2016 Copyright © Taylor & Francis Group, LLCOne of the major drawbacks of the conventional method of land reclamation, which involves mixing cement with the dredged soils at the disposal site, is the high cost associated with its manufacturing and transportation. In this study, a new solidified dredged fill (SDF) technique and a new additive are proposed and their practical applications are discussed. Unlike the conventional approach, the dredged marine soils were mixed with the solidifiers using a newly designed mixing technique prior to its transport to site, which would significantly reduce the cost of site machinery and effectively reclaim land with adequate engineering properties necessary for the construction of infrastructure. To evaluate the performance of the reclaimed land using the proposed technique, a series of laboratory and field tests (namely, static and dynamic cone penetration tests, and plate load tests) were conducted on grounds filled with and without solidified dredged marine soils, respectively. The results showed that the engineering behavior of the reclaimed land with dredged marine soils using SDF technique had significantly improved. The SDF technique combined with the newly designed mixing system improved the performance of ground and has thus proved to be both cost-effective and safe. © 2016 Elsevier Ltd Most constitutive models can only simulate cumulative deformation after a limited number of cycles. However, railroad ballast usually experiences a large number of train passages that cause history-dependent long-term deformation. Fractional calculus is an efficient tool for modelling this phenomenon and therefore is incorporated into a constitutive model for predicting the cumulative deformation. The proposed model is further validated by comparing the model predictions with a series of corresponding experimental results. It is observed that the proposed model can realistically simulate the cumulative deformation of ballast from the onset of loading up to a large number of load cycles. © 2017 American Society of Civil Engineers. This paper presents an innovative semianalytical solution for the expansion of a drained spherical cavity with finite initial radius. The widely known modified Cam-clay model is adopted to capture the nonlinear elastoplastic behavior of soil. The rigorous definitions for the mean and deviator stresses are adopted. The problem is then formulated as a set of first-order ordinary differential equations in the Lagrangian form. The radial and tangential stress and specific volume distribution around the cavity are determined. Extensive parametric study is undertaken to investigate effects of the overconsolidation ratio and relative positioning of elastoplastic interface, among others. The applicability of the proposed theoretical approach is demonstrated by a comparison with laboratory test results. © 2017 American Society of Civil Engineers. Large structures, such as offshore platforms, wind turbine foundations, wide buildings, bridges, and railway granular embankments, are often supported by pile foundations. These structures are usually subjected to large cyclic loads (in axial, lateral, and torsional modes) arising from actions of waves, ship impacts, or moving trains. Significant torsional cyclic forces can be transferred to the foundation piles due to the eccentricity of the lateral loads. In the past, several theoretical and experimental investigations were carried out on piles under axial and lateral cyclic loads; however, study of the influence of torsional cyclic loads on pile foundations is rather limited. This paper presents a novel numerical model based on the boundary element approach to analyze the response of a single, vertical, floating pile subjected to torsional cyclic load. The nonlinear stress-strain response of soil is incorporated, and the pile material was idealized as elastic-perfectly plastic. The effect of progressive degradation of soil strength and stiffness under cyclic stress reversal is incorporated in the numerical method. Apart from predicting the degradation of torsional pile-soil interactive performance, the profiles for shear stress and angle of twist are also captured by the proposed solution. Validation of the model indicates the suitability and accuracy of the proposed solutions. The frequency, amplitude, and number of cycles play significant roles in torsional cyclic response of piles. The proposed model is also applied successfully to selected case studies on single piles under torsional cyclic loading, and important conclusions are drawn from there. © 2017 Institute of Rock and Soil Mechanics, Chinese Academy of Sciences Grading has long been recognised to critically influence the mechanical behaviour of ballast. To identify the ballast grading for heavy-haul rail track, monotonic and cyclic triaxial tests are conducted to assess the performances of different gradings. Permanent deformations, aggregates degradation, resilience, shear resistance, maximum and minimum densities are recorded and analysed. The grading is found to affect the behaviour of ballast in that coarser gradings exhibit relatively better strength, resilience and therefore less permanent deformation. However, ballast degradation increases with the overall aggregate size. Therefore, to identify the grading for ballast with different performance objectives, a grey relational theory is used to convert the multi-objective into single-objective, i.e. grey relational grade. A relatively optimal grading that provides the highest grey relational grade is thus suggested for the improved ballast performance. Lightning is recognised as one of the most detrimental natural disasters. While numerous research studies were carried out on the lightning impulse characteristics of the grounding system and the critical breakdown characteristics of soil, little attention was paid to the impulse current characteristics of soils when lightning strikes. In this study, the performance of typical soft soil in Shanghai under the action of lightning is analyzed. Different factors, including the impulse current waveforms, the front time and half peak time of impulse current, the quantity of electric charge and absorption of unit heat, have been studied by performing a series of laboratory tests. The test results show that the variation of impulse current due to lightning strike is time dependent. The higher the soil temperature, the larger the peak impulse current produced during lightning strike. The value of the front time decreases exponentially, while the value of the half peak time decreases linearly with the rise of soil temperature. Novel empirical relationships between the impulse current characteristics of soil and soil temperature are proposed, with the aim of providing useful practical references for the design of a grounding system for lightning strikes. © 2017 Techno-Press, Ltd. Improvement of soft clay deposit by preloading with vertical drains is one of the most popular techniques followed worldwide. These drains accelerate the rate of consolidation by shortening the drainage path. Although the analytical and numerical solutions available are mostly based on equal strain hypothesis, the adoption of free strain analysis is more realistic because of the flexible nature of the imposed surcharge loading, especially for the embankment loading used for transport infrastructure. In this paper, a numerical model has been developed based on free strain hypothesis for understanding the behaviour of soft ground improvement by vertical drain with preloading. The unit cell analogy is used and the effect of smear has been incorporated. The model has been validated by comparing with available field test results and thereafter, a hypothetical case study is done using the available field data for soft clay deposit existing in the eastern part of Australia and important conclusions are drawn therefrom. © 2016 Elsevier Ltd.Large and frequent loads from heavy freight and passenger trains often lead to the progressive track deterioration. The excessive deformation and degradation of ballast and unacceptable differential settlement of track and/or pumping of underlying soft subgrade soils necessitates frequent and costly track maintenance. However, artificial inclusions such as geogrids and shockmats can mitigate ballast degradation and improve track performance. A quantitative assessment of the influence of breakage, fouling, and the effects of artificial inclusions on the shear behaviour of ballast can be performed either experimentally or numerically. Numerical modelling can simulate these aspects subject to various types of loading and boundary conditions for a range of material properties so in this study, the stress-strain and degradation response of ballast was analysed through discrete element (DEM) and finite element (FEM) methods. In DEM, irregularly shaped ballast aggregates were simulated by clumping together spheres in appropriate sizes and positions. In FEM, a composite multi-layer track system was simulated and an elasto-plastic model with a non-associative flow rule was used to capture ballast degradation. These DEM and FEM simulations showed a good agreement with large-scale laboratory tests. This paper outlines the advantages of the proposed DEM and FEM models in terms of capturing the correct stress-strain and degradation response of ballast with particular emphasis on particle breakage and fouling, as well as applications of geosynthetic grids and shockmats. © 2016 The Authors. Published by Elsevier B.V.A series of large-scale direct shear test were conducted to study the interface shear strength of subballast reinforced with different types of geomembranes and geogrids. The impact of normal stress (n), shearing rate (SR), relative density (DR) and open area (OA%) on the behaviour of granular material was investigated in unreinforced and reinforced condition. The results revealed that the performance of material was markedly influenced by n and OA. The results also showed that geogrids provided a greater value of passive resistance owing to have transverse ribs, but the mobilised passive resistance became smaller with increase in OA. The triaxial grids offered more passive resistance than biaxial geogrid. © 2016 The Authors. Published by Elsevier B.V.Rail track substructure (ballast, subballast and subgrade) is the most essential component of the railway system in view of track stability. The ballast is the largest component of the track substructure and it is the key load-bearing stratum packed with rock aggregates underneath and around the sleepers, thereby providing structural support against dynamic stresses caused by moving trains. However under large dynamic stresses exerted by heavy haul and high speed trains, the degradation of track substructure including ballast becomes significant. This in turn affects the track stability and creates frequent maintenance, thus increasing the life cycle cost of the rail network. Therefore, mitigating degradation of the ballast layer is vital in view of track longevity. In recent years, the use of resilient soft pads (shock mats) above the ballast (i.e. Under Sleeper Pad, USP) and below the ballast (i.e. Under Ballast Mat, UBM) has become a common practice. Many countries, including Australia have adopted the use of resilient pads in the rail track foundation. Currently, the studies on resilient mats are mostly limited to the reduction of vibration and noise. There is a lack of proper assessment of the geotechnical behavior of ballast when used along with shock mats. This paper provides an assessment of the triaxial behavior of the track substructure with and without shock mats under dynamic loading condition. A numerical model was developed based on the modified stress-dilatancy approach to capture the stress-strain and volume change behavior of ballast during impact loading. Model predictions are compared with laboratory results. It was found that the shock mats provide significant advantages in terms of reduced particle breakage and enhanced track stability. © 2016 The Authors. Published by Elsevier B.V.The ballasted railroads form an integral part of the modern transportation infrastructure in Australia. However, they are subjected to large stresses especially on mixed traffic lines, where heavy freight trains are operated. Under such adverse operational conditions, ballast progressively degrades contributing to overall track deformations and frequent maintenance. Maintaining geometry of ballast embankments is necessary to improve safety and efficiency of railway operations. The use of artificial inclusions (geosynthetics and shock mats) as well as recycled (discarded) ballast in track can be economically viable options. In order to gain more insight, the CGRE has conducted extensive field trials on two rail lines in Bulli and Singleton in New South Wales supported by Sydney Trains and Australian Rail Track Corporation, respectively. In these studies, different types of geosynthetics (geogrid, geotextile and geocomposite) and shock mats were installed beneath the ballast layer constructed on varying subgrade conditions. Relative advantages of different geogrids were studied. Traffic induced stresses, ballast breakage, transient and permanent deformations were routinely monitored using precise instrumentation schemes. This paper discusses the details of track construction, instrumentation, monitoring processes and results of these field studies. © 2016 The Authors. Published by Elsevier B.V.In this study, a series of monotonically drained triaxial tests were conducted using the large-scale cylindrical triaxial apparatus. The effect of particle breakage and confining pressure on the mechanical behaviour of ballast were investigated. Based on the experimental findings, mathematical expressions for critical state stress ratio and specific volume are proposed to incorporate the evolution of particle breakage during monotonic shearing. An elasto-plastic constitutive model is formulated within the critical state soil mechanics framework in order to capture the stress-strain behaviour and degradation of ballast. The non-linear variation of shear strength envelope at a given range of confining pressures is taken into account. Mathematical expressions for shear hardening and stress-dilatancy relations are proposed. The constitutive model is calibrated against the results of large-scale laboratory tests and further validated using experimental results available from past independent studies. It is proved that the proposed method can promisingly predict the deformation of the ballast layer in a typical railway environment. © 2016 Jianping Jiang, Qingsheng Chen and Sanjay Nimbalkar. The estimation of the long-term foundation settlement in soft soil is very complex, which is attributed to a number of uncertainties associated with various factors, such as: (i) The compressibility parameters obtained in the laboratory from samples of relatively small size that are more homogeneous compared to heterogeneous field sediments in which various soil types may be interlayered at random and may occur without exhibiting any real stratification; (ii) limitations and unrealistic assumptions prevailing in the conventional consolidation analysis. These have often resulted in the large discrepancy between actual in-situ settlements and the predictions from the conventional consolidation models (e.g., Terzaghi's model). In this study, a field data based method inspired from an observational approach is proposed and validated against a number of high quality long-term field settlement data. Moreover, the corresponding geological soil properties obtained from field and laboratory tests have been presented, with the aim of providing useful practical references for other projects with similar geological profile. Furthermore, the proposed model is compared with existing prediction models. The results show that the newly proposed model can provide more reliable and accurate prediction of foundation settlements compared with other methods established in practice. Indraratna, B, Nimbalkar, S & Rujikiatkamjorn, C 2016, 'A critical review of rail track geotechnologies considering increased speeds and axle loads', Geotechnical Engineering, vol. 47, no. 4, pp. 50-60. Ballasted railroads are designed to provide high speed commuter and heavy haul transportation. Ballast is one of most important load bearing components of the track substructure. However, it often experiences excessive settlement, lateral deformation and particle breakage when subjected to large dynamic (cyclic and impact) stresses. In addition, tracks constructed along coastal areas often undergo large settlements over soft compressible estuarine deposits, leading to frequent and costly track maintenance. The use of artificial inclusions such as geogrids, geocomposites, shock-mats (rubber) and prefabricated vertical drains (PVDs) are attractive options to maintain the vertical and horizontal alignment of tracks and to curtail excessive maintenance costs. This critical review paper provides a deeper insight to the recent advancements in rail track geotechnology at increased train speeds and axle loads. © 2016 A.A.Balkema. All rights reserved. The east coast of China, in particular Shanghai, is frequently exposed to lightning, and the resulting annual loss approaches US$30 million. All kinds of protection devices transfer the lightning current and the energy into the ground. In this study, the characteristics of the typical soft soil in Shanghai with different values of water content and salinity under the action of lightning shock have been analysed by an impulse current generator and a selfdesigned test equipment. The test results show that the current waveform from the impact of lightning in soils has a steep rise and a slow fall. At the same lightning intensity, higher water content or salinity leads to (a) shorter peak time, (b) larger peak current waveform, (c) quicker release speed and (d) larger lightning impulse response. The test results are valuable in guiding the design and the reformation of lightning protection and grounding systems. © 2014, NRC Research Press. A substantial amount of experimental evidence suggests that the critical state envelope for ballast is nonlinear, especially at low confining pressure. To study the implications of this nonlinearity and the associated role of particle breakage, monotonically loaded drained triaxial tests were conducted using a large-scale cylindrical triaxial apparatus. A nonlinear critical state envelope is determined in the q–p= and -–lnp= planes. Mathematical expressions for critical state stress ratio and specific volume are proposed to incorporate the evolution of particle breakage during monotonic shearing. In this paper, an elastoplastic constitutive model based on the critical state soil mechanics framework is presented to capture the salient aspects of stress– strain behaviour and degradation of ballast. Constitutive parameters were conveniently determined from large-scale laboratory tests. The model is able to predict the monotonic shear behaviour of ballast corroborating with the laboratory measurements. The proposed model is further validated using experimental results available from past independent studies. © 2014 Elsevier Ltd. The adoption of heavier axle loads and high speed rails have posed serious geotechnical issues with ballasted railway tracks. These issues include poor drainage of soft coastal soils, ballast degradation under cyclic and impact loads, differential settlement of track and misalignment due to lateral movements, and inadequate bearing capacity of some compacted ballast. The mechanisms of ballast degradation and deformation, the need for effective track confinement, understanding of interface behaviour, determining dynamic bearing capacity and use of energy absorbing shock mats and synthetic grids require further insight to improve the existing design guidelines for future high speed commuter and heavier freight trains. In this paper, the current state-of-the-art knowledge of rail track geomechanics is discussed, with particular emphasis on the effects of geosynthetic applications on ballast degradation, and track performance. The stress-strain response and volumetric changes of ballast stabilised with geosynthetics observed in the laboratory experiments were captured through discrete element and finite element models. Installing shock mats and geosynthetics in the track substructure led to the attenuation of high cyclic and impact forces, thereby mitigating ballast degradation. Comprehensive field studies on instrumented tracks at Bulli (near Wollongong) and Singleton (near Newcastle) supported by Sydney Trains and ARTC, were carried out to measure the in situ stresses and deformation of ballast embankments. The paper focuses primarily on research conducted at University of Wollongong for enhanced track performance, highlighting some examples of innovation from theory to practice. © 2014, Thomas Telford Services Ltd. All rights reserved. The size and shape of particles influence how effectively coarse angular aggregates of ballast interact. The aim of this study was to improve the characterisation of ballast particles using a threedimensional (3D) imaging method. Various size and shape indices, such as elongation ratio, sphericity and roundness, were determined from the scanned 3D images. A modified index called 'ellipsoidness' was proposed to capture adequately the shape of the 3D particles. Variation of these indices with particle size was studied. Comparison of the 3D true sphericity and the corresponding two-dimensional sphericity indicated that the latter would underestimate sphericity. A modified approach for transforming particle size distribution to constriction size distribution is proposed by capturing the size and shape effects of particles. This paper presents details of the advancements of the Australian Research Council Centre of Excellence for Geotechnical Science and Engineering to the apparatus, facilities and methods for physical modelling in geotechnics. This advancement includes (i) the launch of a National Geotechnical Centrifuge Facility with a new 10 m diameter fixed beam centrifuge that will be capable of spinning 2.4 tonnes of soil at 100 gravities, (ii) a new mobile soft soil in situ testing laboratory, (iii) a new national facility for the cyclic testing of high-speed rail and (iv) three recirculating flumes, called O-tubes, which are presented in another paper of this special issue. This paper provides an overview of this new equipment and the aims of the research that it will underpin. The equipment will provide enhanced possibilities for Australia to conduct project specific testing for future energy and transportation infrastructure developments, nationally and internationally. Increasing demand for High Speed Rail (HSR) and fast heavy haul poses a serious challenge for stability of tracks on problematic ground. Ballast is a key track foundation material placed underneath the sleepers which provides structural support against high cyclic and impact stresses caused by moving trains. Degradation of ballast contributes to a large percentage of track maintenance costs apart from affecting longevity and stability. In recent years, use of elastometric soft pads underneath sleepers has become increasingly popular as means of reducing track damage. The 'shock mat' placed under the sleeper is traditionally called Under Sleeper Pad (USP), and when it is placed under ballast, the term Under Ballast Mat (UBM) is often used. Currently there is lack of comprehensive assessment on the geotechnical behaviour of ballast using these artificial inclusions under impact and cyclic loading. In this study, a series of largescale laboratory tests were conducted to understand the performance of these energy absorbing 'shock mats' in the attenuation of impact and cyclic stresses and subsequent mitigation of ballast degradation. Impact loads were simulated using a high-capacity drop-weight impact testing equipment, while the cyclic loads were simulated using a large-scale prismoidal process simulation test apparatus. This paper presents a state-of-the-art review of laboratory studies and field trials demonstrating the benefits of USPs and UBMs in rail industry. A series of large-scale cyclic triaxial tests were conducted on latite basalt aggregates (ballast) to investigate how the frequency faffects the permanent deformation and degradation of railway ballast. During testing the frequency was varied from 5 Hz to 60 Hz to simulate a range of train speeds from about 40 km/h to 400 km/h. Three categories of permanent deformation mechanisms were observed in response to the applied cyclic loads, namely, the inception of plastic shakedown (f < 20 Hz), then plastic shakedown and ratcheting (30 Hz < f < 50 Hz), followed by plastic collapse at higher frequencies (f > 60 Hz). The permanent strain of ballast and particle breakage increased with the frequency and number of load cycles. A cyclic strain ratio was introduced to capture the effect of frequency on the permanent axial and volumetric strains, respectively. An empirical equation was formulated to represent this relationship for latite basalt, and a critical train speed was identied. A good correlation was obtained between particle breakage and volumetric strain under cyclic loading. Indraratna, B, Nimbalkar, S & Rujikiatkamjorn, C 2014, 'Enhancement of rail track performance through utilisation of geosynthetic inclusions', Geotechnical Engineering, vol. 45, no. 1, pp. 17-27. In coastal regions of Australia, high population density and increased traffic volumes have led to rapid expansion of rail transport. Use of artificial inclusions such as polymeric geosynthetics for enhanced soil-structure interaction and rubber shock mats for absorbing energy with the aim of reducing particle breakage is described in this paper as a cost-effective option. This paper highlights the results of a laboratory study on the deformation of coal fouled ballast stabilised with geogrids, at various degrees of fouling. A novel Track Process Simulation Apparatus (TPSA) was employed to reproduce realistic rail track conditions under cyclic loading, and the Void contaminant index (VCI) was used to assess the level of ballast fouling. The beneficial aspects of the geogrid inclusion are discussed in the paper. Laboratory results showed that biaxial geogrids can reduce the deformation of fresh ballast, but their effectiveness diminishes with an increase of VCI. A threshold value of VCI was proposed in view of track maintenance. Comprehensive field trials were executed on two fullscale rail tracks in the towns of Bulli and Singleton in New South Wales. These trials facilitated the evaluation of the relative performance of different types of geogrids, geocomposites and shock mats installed in fully instrumented track sections. Field trials showed that the use of recycled ballasted in rail tracks was a feasible and effective alternative. The performance of geogrids and geocomposite was found to be associated with their geometrical and mechanical properties as well as with the type of subgrade. The distributions of vertical and lateral stresses in the track were also assessed. In addition, effects of magnitude of axle load and train speed on stress distributions were studied. Copyright © 2014 Southeast Asian Geotechnical Society (SEAGS). All Rights Reserved. Rail tracks undergo degradation owing to particle breakage and fouling of ballast by various fines including coal and subgrade soil. As the ballast becomes fouled, its strength and drainage capacity are compromised, sometimes resulting in differential settlement and reduced track stability. This paper demonstrates a continuum mechanics based framework to evaluate the detrimental effect of fines on the strength, deformation and degradation of coal-fouled ballast under monotonic loading. An elastoplastic constitutive model that considers the effect of fines content and energy consumption associated with particle breakage during shearing is presented. This multiphase constitutive model is developed within a critical state framework based on a kinematic-type yield locus and a modified stress-dilatancy approach. A general formulation for the rate of ballast breakage and coal particle breakage during triaxial shearing is presented and incorporated into the plastic flow rule to accurately predict the stress-strain response of coal-fouled ballast at various confining pressures. The behaviour of ballast at various levels of fouling is analysed and validated by experimental data. © 2014 Elsevier Ltd.
© 2014 Thomas Telford Services Ltd. All rights reserved. The size and shape of particles influence how effectively coarse angular aggregates of ballast interact. The aim of this study was to improve the characterisation of ballast particles using a three-dimensional (3D) imaging method. Various size and shape indices, such as elongation ratio, sphericity and roundness, were determined from the scanned 3D images. A modified index called 'ellipsoidness' was proposed to capture adequately the shape of the 3D particles. Variation of these indices with particle size was studied. Comparison of the 3D true sphericity and the corresponding two-dimensional sphericity indicated that the latter would underestimate sphericity. A modified approach for transforming particle size distribution to constriction size distribution is proposed by capturing the size and shape effects of particles. In the last fifteen years, Tekseal high yield foaming grout ore pass plugs that could later be easily removed, have been poured above chute maintenance areas providing protection from high energy rock impact and isolating workers from the hazard. Construction and removal methods will be briefly explained. Since it is not economically feasible to investigate the problem of ore pass plug impact response using full-scale experimental studies, this paper presents a combined four-stage approach that includes (1) laboratory testing to investigate the mechanical behaviour of the high-yield foaming grout; (2) high-precision impact testing of reduced-scale models of ore pass plugs; (3) high-fidelity physics-based numerical model calibration using experimental data; and (4) full-scale modelling of mine ore pass plugs using calibrated material models. To calibrate numerical models, three one-metre diameter steel pipes filled with Tekseal high yield foaming grout were tested with falling steel projectiles of different shapes. Impact tests provided data on the depth of penetration and size of the craters formed by the projectiles. Numerical models were calibrated by optimising the material parameters and modelling techniques to provide the best match with the experimental results. Full-scale numerical models of ore pass plugs were developed for typical ore pass dimensions and subjected to impact events by falling rock projectiles. The proposed approach has allowed investigating energy absorbing characteristics of ore pass plugs to further predict and increase understanding of their capacity to withstand high-speed impacts by large falling projectiles. © 2014 Elsevier Ltd.
Tennakoon, N., Indraratna, B., Rujikiatkamjorn, C., Nimbalkar, S. & Neville, T. 2012, 'The Role of Ballast-Fouling Characteristics on the Drainage Capacity of Rail Substructure', GEOTECHNICAL TESTING JOURNAL, vol. 35, no. 4, pp. 629-640. The ballast layer is designed to be free draining, but when the voids of the granular medium are wholly or partially filled because of the intrusion of fine particles, the ballast is considered to be "fouled." To ensure acceptable track performance, it is necessary to maintain good drainage within the ballast layer. This paper critically examines the current methods commonly used for evaluating the degree of ballast fouling and, because of their limitations, a new parameter, "void contaminant index" is introduced. A series of large-scale constant head hydraulic conductivity tests were conducted with different levels of fouling to establish the relationship between the void contamination index and the associated hydraulic conductivity. Subsequently, a numerical analysis was executed to simulate more realistic two-dimensional flow under actual track geometry capturing the drainage capacity of ballast in relation to the void contamination index. In the context of observed test data, the drainage condition of the track could be classified into different categories together with a classification chart capturing the degree of fouling. The contents of this paper have already been considered in track maintenance schemes in the states of Queensland and New South Wales. Copyright © 1996-2012 ASTM. J. Ross Publishing, Inc. © 2008 Effect of both the wall and soil inertia must be considered for the design of retaining wall under seismic conditions. In this paper, by considering pseudo-dynamic seismic forces acting on the soil wedge and the wall, the required weight of the wall under seismic conditions is determined for the design purpose of the retaining wall under active earth pressure condition. The method proposed considers the movement of both shear and primary waves through the backfill and the retaining wall due to seismic excitation. A rigid vertical retaining wall supporting cohesionless backfill with horizontal ground has been considered in the present analysis by considering planar rupture surface. Results in graphical form show the variations of proposed design factors viz. soil thrust factor (FT), wall inertia factor (FI) and combined dynamic factor (Fw) with respect to horizontal seismic acceleration coefficient (kh), required for the design of the wall under seismic conditions. Also the effects of variation of parameters like soil friction angle, wall friction angle, vertical seismic acceleration, period of lateral shaking and amplification factor on combined dynamic factor have been studied. A comparative study between the present theory and available pseudo-static results has shown the merits of the present analysis. Prediction of the seismic rotational displacements of retaining wall under passive condition is an important aspect of design in earthquake prone region. In this paper, the pseudo-dynamic method is used to compute the rotational displacements of rigid retaining wall supporting cohesionless backfill under seismic loading for the passive earth pressure condition. The proposed method considers time, phase difference and effect of amplification in shear and primary waves propagating through both the backfill and the retaining wall. The influence of ground motion characteristics on rotational displacement of the wall is evaluated. Also the effects of variation of parameters like wall friction angle, soil friction angle, amplification factor, shear wave velocity, primary wave velocity, period of lateral shaking, horizontal and vertical seismic accelerations on the rotational displacements are studied. The rotational displacement of the wall increases substantially with increase in amplification of both shear and primary waves, time of input motion, period of lateral shaking and decreases with increase in soil friction angle, wall friction angle. The rotational displacements of the wall also increase when the effect of wall inertia is taken into account. Results are provided in graphical form. © 2006 Elsevier Ltd. All rights reserved. Knowledge of seismic active earth pressure behind rigid retaining wall is very important in the design of retaining wall in earthquake prone region. Commonly used Mononobe-Okabe method considers pseudo-static approach, which gives the linear distribution of seismic earth pressure in an approximate way. In this paper, the pseudo-dynamic method is used to compute the distribution of seismic active earth pressure on a rigid retaining wall supporting cohesionless backfill in more realistic manner by considering time and phase difference within the backfill. Planar rupture surface is considered in the analysis. Effects of a wide range of parameters like wall friction angle, soil friction angle, shear wave velocity, primary wave velocity and horizontal and vertical seismic accelerations on seismic active earth pressure have been studied. Results are provided in tabular and graphical non-dimensional form with a comparison to pseudo-static method to highlight the realistic non-linearity of seismic active earth pressures distribution. © Springer 2006. Nimbalkar, SS, Choudhury, D & Mandal, JN 2006, 'Seismic stability of reinforced-soil wall by pseudo-dynamic method - Reply', GEOSYNTHETICS INTERNATIONAL, vol. 13, no. 6, pp. 277-278. Faster and cheaper rail transport(s) is an essential means of catering for the demand for travel and supply chains in the public and private sectors. Such a development in coastal areas would necessitate the use of ground improvement techniques to improve track performance and sustainability. While ballast stabilizes tracks so they can support heavy traffic loads and provide rapid drainage, ballast settlement, fouling, and excessive lateral displacement leads to differential settlement, loss of track geometry, and requires costly and regular maintenance. Optimizing the use of maintenance funds is a challenging task because comprehensive methods of predicting track longevity due to time-dependent and rapid deterioration of ballast simply do not exist. Track construction therefore requires appropriate ballast stabilization techniques using geosynthetics and shock mats, the effectiveness of which depends also on the type of subgrade. Comprehensive field trials were carried out on two rail lines at Bulli and Singleton, New South Wales, Australia. In these studies, several track sections were reinforced with various types of geosynthetics: three types of biaxial geogrids and a geocomposite (a combination of biaxial geogrid and nonwoven geotextile) and a layer of shock mat placed beneath the ballast embankment. Both fresh and recycled ballast were examined for varying subgrade conditions, and recoverable and irrecoverable deformations of the track substructure were routinely monitored. It was found that geogrids and geocomposites can decrease the vertical strains of the ballast layer, and thus reduce maintenance costs. It was also found that geogrids were more effective when the subgrade was soft, and shock mats also helped mitigate particle breakage when laid on a stiff base such as the deck of a concrete bridge. © Copyright 2018 by ASTM International. This paper describes salient features of a set of large-scale ballast testing equipment developed at the University of Wollongong, Australia, and how the test results and research outcomes have contributed to transforming tracks in the Australian heavy haul and commuter networks, particularly with regards to the strength, deformation, and degradation of ballast. Ideally, ballast assemblies should be tested in prototype scale under actual loading conditions. This is because a reduction in particle sizes for testing in smaller equipment can reduce the internal angle of friction (shearing resistance) of the granular assembly in a macro sense, and the angularity of the particles in a micro sense, and hence the volumetric changes during the shearing process. In response to the worldwide lack of proper test facilities for ballast, the University of Wollongong has, since the early 1990s, designed and built a number of large-scale process simulation triaxial testing rigs. They are all custom made to minimize any boundary effects and also to evaluate the deformation and degradation of ballast, particularly the size, shape, and origin of aggregates used as ballast in Australian tracks. This triaxial process simulation equipment was originally used to characterize the behavior of coarse aggregate used for state railway standards for monotonie loading, but since then it has been fitted with dynamic actuators to simulate actual track conditions involving the true cyclic loading nature while also capturing the wheel-rail dynamics that correspond to high-speed commuter rail and fast heavy-haul operations. These tests invariably demonstrated completely different stress-strain and volumetric characteristics of ballast compared to conventional static or monotonie testing of the same test specimens. © 2018 19th ICSMGE Secretariat. All rights reserved. This article presents the results of numerical simulations of cyclic loading tests conducted on particles that simulate railroad ballast. The objective of this study was to evaluate the deformation of ballast under a large number of loading cycles and to study the influence of the two different particle size distributions. One of them was according to particle size distribution recommended by Indraratna and co-workers in the past as an improvement to Australian Standard and the other was prepared in accordance with Brazilian standard. The discrete element method offers a new means of studying the response characteristics of railway ballast. The basic idea of discrete element method (DEM) is that arbitrary discontinuities are divided into a set of rigid elements, making each rigid element satisfy the equations of motion, use time step iteration method for solving the equations of motion of rigid elements, and then obtain the overall movement patterns of arbitrary discontinuities. In this study, the discrete element method of analysis has been used to simulate the geotechnical behaviour of railway ballast observed during the testing. © ASCE.In order to understand the permanent deformation and degradation of railway ballast under high speed train loading, a series of cyclic triaxial tests were conducted using large-scale cylindrical apparatus. The frequency was used from 5 Hz to 60 Hz corresponding to the train speeds from about 40 km/h to 400 km/h. Three types of permanent deformation mechanisms were observed in response to the applied cyclic loads, namely, plastic shakedown at relatively lower frequency, ratcheting at an increased frequency, and plastic collapse at higher frequencies. Correspondingly, four types of particle degradation were observed. The magnitudes of ballast deformation and degradation were found to increase with the frequency and number of load cycles. A critical train speed was identified. Moreover, a good correlation was obtained between particle breakage and volumetric strain under cyclic loading. © 2016 The Authors. Published by Elsevier B.V.This article presents the results of numerical simulations of loading tests conducted on coarse particles that simulate railroad ballast. The objective of this study was to evaluate the deformation of ballast under vertical loading and to study the influence of the two different particle size distributions. One of them was according to particle size distribution recommended by Indraratna and co-workers in the past as an improvement to Australian Standard and the other was prepared in accordance with Brazilian standard. The discrete element method offers a new means of studying the response characteristics of railway ballast. The basic idea of discrete element method (DEM) is that arbitrary discontinuities are divided into a set of rigid elements, making each rigid element satisfy the equations of motion, use time step iteration method for solving the equations of motion of rigid elements, and then obtain the overall movement patterns of arbitrary discontinuities. In this study, the discrete element method of analysis has been used to simulate the geotechnical behaviour of railway ballast observed during the triaxial testing. Three-dimensional numerical simulations were performed using discrete element modeling approach. The granular media (i.e., ballast and sub-ballast) used in ballasted rail tracks undergo large deformations along with particle breakage when subjected to cyclic loads exerted by heavy and fast trains. The deformation and degradation of such granular layers severely affects track geometry and results into increased maintenance costs. The use of artificial inclusions in planar (geogrid, geotextile, and geocomposite) as well as three-dimensional form (geocell) is essential to curtail such costs and improve track stability. A series of cyclic drained triaxial tests were conducted using large-scale prismoidal process simulation apparatus designed and built at the University of Wollongong. Effects of external confining pressure, frequency, and number of load cycles were investigated. The test results showed that large deformation and degradation of ballast was imminent under high frequency cyclic loading. It was also shown that settlement of the ballast and sub-ballast can be reduced significantly employing geocomposites and geocells, respectively. The results revealed the effectiveness of the geocell, when they are used at low confinement and higher frequencies. This paper provides an insight to cyclic behavior of railroad granular substructure and demonstrates the role of confinement induced through the use of artificial inclusions. Indraratna, B, Nimbalkar, S, Rujikiatkamjorn, C & Heitor, A 2014, 'Ground improvement in transport geotechnics - from theory to practice', Computer Methods and Recent Advances in Geomechanics - Proceedings of the 14th Int. Conference of International Association for Computer Methods and Recent Advances in Geomechanics, IACMAG 2014, International Conference of the International Association for Computer Methods and Advances in Geomechanics, CRC Press, Kyoto, Japan, pp. 35-44. Nimbalkar, S & Indraratna, B 2014, 'Numerical and analytical modeling of particle degradation', Computer Methods and Recent Advances in Geomechanics - Proceedings of the 14th Int. Conference of International Association for Computer Methods and Recent Advances in Geomechanics, IACMAG 2014, International Conference of the International Association for Computer Methods and Advances in Geomechanics, CRC Press, Kyoto, Japan, pp. 261-266. Large cyclic loads are nowinevitable due to an increased demand for freight and public transport. The ballast layer subjected to these repeated traffic loads in a real track environment undergoes excessive deformation and degradation. Ballast degradation is influenced by various factors including the amplitude and number of load cycles, confining pressure, frequency, the angularity as well as fracture strength of individual grains. Given the complexities of the behaviour of the rail track, the current track analysis techniques are overly simplified. Considering this, an elasto-plastic constitutive model of a composite track is proposed. The largescale laboratory tests are simulated in a numerical model and the results are then analyzed to better understand the distribution of displacements and stresses inside the ballast layer. The advantages of the elasto-plastic finite element simulations when compared to conventional analytical methods used by practitioners that are primarily based on a linear elastic approach are demonstrated. © 2015 Taylor & Francis Group, London. © Civil-Comp Press, 2014. Ballast fouling is understood as major cause of track deterioration in many countries over the world. It decreases the drainage and load bearing capacity of the ballast layer. A series of large scale hydraulic conductivity tests were conducted with different proportions of fouling to access the drainage capacity of the track. A numerical analysis was conducted using SEEP/W to quantify the drainage capacity of ballast under different degrees of fouling. Subsequently, track drainage classification in relation to the degree of fouling, which is a very useful tool for practical engineers, is presented in this paper. The analysis showed that both the location and extent of fouling played an important role when assessing the overall drainage capacity of track. In order to establish the relationship between the extent of fouling and the associated strength-deformation properties, a series of large scale monotonic triaxial tests were carried out for different levels of fouling for three different confining pressures. Based on the laboratory findings, a novel empirical relationship between the peak deviator stress and VCI has been proposed to assist the practitioner in their preliminary track condition assessment. By considering drainage and strength aspects, a critical level of fouling to assist in track maintenance planning has been considered. The transportation infrastructure in coastal regions of Australia has been expanded in recent years due to high population density and increased traffic volume. Such expansions require the application of ground improvement techniques to improve performance and sustainability of the infrastructure. In this paper, innovative ground improvement techniques applicable to railway embankments, port reclamation and embankment fills are discussed. For ballasted rail tracks, the performance of different types of geosynthetics for improving the stability and drainage of railway tracks under high cyclic loading is investigated. Instrumented tracks were conducted to measure the in-situ stresses and deformations of ballast at Bulli, New South Wales (NSW), Australia. Furthermore, stabilization of soft formation soils underneath rail tracks using prefabricated vertical drains (PVDs) is also studied through finite element analyses and field measurements at Sandgate. The innovative use of the mixtures of coal wash (CW) and steel furnace slag (SFS) as the reclamation fill is demonstrated through laboratory and field investigations at the Outer Harbor extension of Port Kembla in Wollongong, NSW. The optimum CW-SFS mixtures that may meet most of the geotechnical specifications are proposed to be used as an effective structural fill. Finally, the design of the combined vacuum and surcharge fill system and the construction of the road embankment are described using a case study from the Pacific Highway upgrade project. Field data are presented and interpreted to demonstrate how the embankments performed during construction in both vacuum and non-vacuum areas. © ASCE 2014. Rail tracks are conventionally built on compacted ballast and structural fill embankments overlying the natural subsoil. Ballast plays an important role in providing track stiffness to support heavy traffic loads, and providing rapid drainage. However, ballast deforms and degrades progressively under the heavy cyclic loading of passenger and freight trains, which may lead to a loss of track geometry, and require costly regular maintenance. In particular, track construction requires appropriate stabilization techniques for ballast, the extent of which depends also on the type of subgrade. Comprehensive field trials were carried out on two rail lines in Bulli and recently in Singleton, New South Wales, Australia. In these studies, several track sections were reinforced with different types of geosynthetics placed beneath the ballast embankment. Both fresh and recycled ballast was examined for varying subgrade conditions. Recoverable and irrecoverable deformations of the substructure were routinely monitored. It was found that geogrids and geocomposites can decrease the vertical strains of the ballast layer, resulting in reduced maintenance costs. This paper describes the comprehensive field instrumentation, construction procedures, and field performance evaluation of these full-scale geosynthetic- stabilized ballast embankments in Bulli and Singleton. © 2013 American Society of Civil Engineers. Indraratna, B, Nimbalkar, S, Rujikiatkamjorn, C, Neville, T & Christie, D 2013, 'Performance assessment of synthetic shock mats and grids in the improvement of ballasted tracks', 18th International Conference on Soil Mechanics and Geotechnical Engineering: Challenges and Innovations in Geotechnics, ICSMGE 2013, pp. 1283-1286. In Australia, railways offer the most prominent transportation mode in terms of traffic tonnage serving the needs of bulk freight and passenger movement. Ballast is an essential constituent of conventional rail infrastructure governing track stability and performance. However, in recent times, higher traffic induced stresses due to dramatically increased train speeds and heavier axle loads have caused excessive plastic deformations and degradation of ballast. This seriously hampers safety and efficiency of express tracks, for instance, enforcing speed restrictions and effecting more frequent track maintenance. Installing layers of synthetic materials such geogrids and rubber pads (shock mats) in rail tracks can significantly reduce ballast degradation. Field trials were conducted on rail track sections in the towns of Bulli (near Wollongong City) and Singleton (near Newcastle) to measure track deformations associated with cyclic stresses and impact loads. This paper describes the results of large-scale laboratory testing as well as the observations from full-scale instrumented field trials characterising the behaviour of rail ballast improved by shock mats and synthetic grids. Railways in Australia still play a significant role in the intrastate transport of passenger and freight. In recent years, the increased demand for heavier and faster trains has posed greater challenges to railway industry to improve efficiency and stability of track while decreasing track maintenance costs. The ballast layer plays a key role in governing the stability and performance of rail tracks. However, high traffic induced stresses always result in large plastic deformations and degradation of ballast, which in turn leads to significant loss of track stability. This problem becomes severe under impact loading because it accelerates the breakage of ballast particles. Therefore, understanding the complex mechanisms involved with the transfer of impact loads on the substructure and their effect on ballast breakage and degradation is essential when designing new tracks and rehabilitating existing ones. The field trial in Bulli (near Wollongong) demonstrated that in case of train with wheel flats, extremely high pressure can be transmitted to the ballast bed. Installing resilient mats such as rubber pads (shock mats) in rail tracks can lead to attenuation of impact forces and subsequent mitigation of ballast degradation. In view of this, a series of laboratory tests using a high capacity drop-weight impact testing equipment has been carried out to evaluate the effectiveness of shock mats. This paper describes large-scale laboratory testing and full-scale instrumented field trial carried out to quantify the geotechnical behavior of ballast improved by using shock mats and synthetic grids respectively. © 2012 American Society of Civil Engineers. Australia relies heavily on rail for the transportation of bulk commodities and passenger services, and has introduced faster and heavier trains in recent years due to a growing demand. Large cyclic loading from heavy haul and passenger trains often leads to progressive deterioration of the track. The excessive deformations and degradations of the ballast layer and unacceptable differential settlement or pumping of underlying soft and compressible subgrade soils necessitate frequent costly track maintenance works. A proper understanding of load transfer mechanisms and their effects on track deformations are essential prerequisites for minimising maintenance costs. The reinforcement of the track by means of geosynthetics leads to significant reduction in the downward propagation of stresses and assures more resilient long-term performance. The geocomposite serves the functions of reinforcement, drainage and separation, thereby reducing the vertical and lateral deformations. Stabilization of soft subgrade soils by using prefabricated vertical drains (PVDs) is also essential for improving the overall stability of track and to reduce the differential settlement during the operation of trains. The effectiveness of using geocomposite geosynthetic and PVDs has been observed through field measurements and finite element analyses. These have been the first fully instrumented, comprehensive field trials carried out in Australian Railways, and it was very encouraging to see the field observations matching the numerical predictions. © ASCE 2011. Nurcan, S 2011, 'Preface', CEUR Workshop Proceedings. Ballasted Rail tracks are widely used throughout the world due to its resiliency to the repeated wheel loads, low construction cost and ease of maintenance. However, the ballast layer needs periodic maintenance due to its deformation and degradation associated with particle breakage and fouling. A proper understanding of the contamination due to various types of fines and its implications on track drainage is a pre-requisite for effective implementation of track maintenance operations. A new parameter Void Contaminant Index (VCI) can accurately assess the contamination as it includes the effect of void ratio, specific gravity and gradation of ballast and fouling material. A series of constant head hydraulic conductivity tests using a specially designed large-scale permeability apparatus were performed on fresh ballast mixed with different proportions of fines to study the relationship between the percentage of fouling and drainage characteristics. A field trial is conducted on an instrumented track at Bulli, NSW Australia, to study the benefits of a geocomposite layer installed at the ballast-capping interface, and to evaluate the performance of recycled ballast in comparison to traditionally uniform fresh ballast. It is found that recycled ballast can be effectively reused if reinforced with a geocomposite. The geocomposite can effectively reduce vertical and lateral deformations of the ballast with obvious implications on improved track stability thereby reducing maintenance costs. © 2010 ASCE. The stability of tailings dams in earthquakes prone areas has become a matter of increasing concern as seismic knowledge has advanced. For the seismic slope stability assessment of tailings dam, majority of current design methodologies rely on the use of pseudo-static approach. However, the crude estimate of finding approximate seismic accelerations makes the pseudo-static approach too conservative to adopt in the stability assessment. In this paper, horizontal slice method is used which considers the seismic inertia forces acting on the sliding wedge of the tailings dam by incorporating the effects of time, phase difference and amplification in shear and primary waves along with the horizontal and vertical seismic accelerations and other soil properties. Results are provided in the graphical form for the stability analysis of tailings dam. © 2010 ASCE. Indraratna, B, Nimbalkar, S & Christie, D 2009, 'The performance of rail track incorporating the effects of ballast breakage, confining pressure and geosynthetic reinforcement', BEARING CAPACITY OF ROADS, RAILWAYS AND AIRFIELDS, VOLS 1 AND 2, 8th International Conference on the Bearing Capacity of Roads, Railways and Airfields, CRC PRESS-TAYLOR & FRANCIS GROUP, Champaign, IL, pp. 5-+. Seismic stability of tailings dams and embankments is an important topic which needs the special assessments by the researchers as it is mainly governed by the safety concerns. Several researchers in the past had attempted to investigate the seismic stability of earthen dams and embankments by using conventional pseudo-static method of analysis. However, the crude estimate of finding the approximate seismic acceleration makes the pseudo-static approach too conservative to adopt in the stability assessment. Although a few researchers in the recent past highlighted the limitations and drawbacks of the pseudo-static approach, there are very limited studies being reported worldwide for the seismic stability assessment of earthen dams and embankments by using alternative methods of analysis. In this paper, a recently developed and modified pseudo-dynamic method of analysis is used to compute the seismic inertia forces acting on the sliding wedge of the tailings dam by considering the effects of time of seismic accelerations, phase differences in the propagating shear and primary waves in the soil during an earthquake, frequency of earthquake excitation etc. with the horizontal and vertical seismic accelerations. The factor of safety decreases with increase in the seismic accelerations and phase difference in body waves. Influence of various parameters such as seismic acceleration coefficients, period of lateral shaking on seismic stability of tailings dam are studied under harmonic seismic loading conditions for both empty and full water cases. Present results are compared with the pseudo-static based solutions to validate the findings of the pseudo-dynamic method of analysis. © 2009 IOS Press. Nimbalkar, SS & Choudhury, D 2008, 'Computation of point of application of seismic passive resistance by pseudo-dynamic method', 12th International Conference on Computer Methods and Advances in Geomechanics 2008, pp. 2636-2643. Computation of seismic passive resistance and its point of application is an important aspect of seismic design of retaining wall. Several researchers in the past had obtained seismic passive earth pressures by using the conventional pseudo-static method. In this pseudo-static method, peak ground acceleration is assumed as constant and seismic passive pressure thus obtained shows the linear variation along the height of the retaining wall. There is hardly any scope to find out the point of application of seismic passive resistance by pseudo-static approach but to assume it to act at one-third height from the base of the wall. Rectifying these errors, in recently developed pseudo-dynamic method of analysis, all these factors are considered to compute seismic passive earth pressures. In this paper, an attempt has been made to compute the point of application of seismic passive resistance using limit equilibrium method of analysis with pseudo-dynamic approach. Effects of variation of parameters like wall friction angle, time period of earthquake ground motion, seismic shear and primary wave velocities of backfill soil, soil amplification and seismic peak horizontal and vertical ground accelerations on the seismic passive earth pressure are studied. Choudhury, D, Nimbalkar, SS & Mandal, JN 2006, 'Influence of soil-wall interface friction on pseudo-dynamic earth pressure', 8th US National Conference on Earthquake Engineering 2006, pp. 6466-6475. Knowledge of the dynamic earth pressure is essential for the safe design of retaining wall in the seismic zone due to the devastating effect of earthquake. In this paper the seismic earth pressure on a rigid retaining structure for both active and passive conditions are determined by pseudo-dynamic method. Conventional pseudo-static approach gives the linear distribution of seismic earth pressure behind retaining wall in an approximate way. However, the proposed pseudodynamic method gives the non-linear distribution of seismic earth pressure in more realistic manner by considering the variation of shear and primary wave velocities along the depth of the wall combined with the horizontal and vertical seismic accelerations. Movement of the wall with respect to soil guides the formation of active or passive earth pressure along with the frictional force at soil-wall. Results are presented in graphical form for non-dimensional seismic earth pressure distribution for different cases of wall friction angle under both active and passive conditions. Design values of the seismic earth pressure coefficients are found to change significantly under seismic conditions. Comparison of present results with pseudo-static approach describes the necessity and merits of the present solution. Copyright © (2006) by Earthquake Engineering Research Institute All rights reserved.